Whether you want to unite your sales and service teams to provide a seamless service or make one SUPER team that has the skills to do both, loving your customer is the way to go. Love equals Loyalty which ultimately leads to Advocacy and Sales. We know there is little point in JUST giving your people tools for how to give a great sales and service experience. They know what ‘great’ does and doesn’t look like, they see every day as customers themselves. It has to go deeper than that. They need to understand WHY they WANT to do it. If your organisation is ready to go deeper, really love your customers and give them a spectacular experience then we’re your guys! We start by helping you to create a customer centred culture in your organisation. We believe that to truly enhance the experience for your customer the whole customer lifecycle or journey must be evaluated. We often find that some aspects of the lifecycle are stronger than others and no two lifecycles are the same. We also know that when it comes to sales and service there is always opportunity to enhance the experience. With our approach any gaps and holes are identified and plugged, performance is improved and customer satisfaction and advocacy is increased. 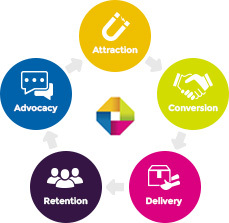 During this unique holistic approach of creating a customer centred culture and analysing your customer journey, we look at each important stage to see what works and what could be improved, learning from the best and enhancing the less effective. After all, your organisation’s sales and service chain is only as strong as the weakest link. So if you want to sell more, focus on how you show love and serve at each step of the lifecycle. YOUR CUSTOMER – I want a consistent experience and to feel loved and valued by whomever I deal with in the organisation. Whatever your start point is we can join your quest to enhance the customer experience at any (or as many) of the 5 stages involved. People often say if they attend a training course and learn one new thing that it’s been worthwhile. Well that’s not good enough for us. We want you to tick as many boxes as you need with our training which is why we offer a ‘Wish List’ design service combining elements from different subjects and blending them into a seamless learning experience. You may not see how the subjects could fit together, but you don’t have to, that’s our job. You create the wish list and we do the rest! We also don’t ‘Sheep Dip’ delegates. Not everyone needs all the training to the same level. We train those who need training on what they need to know. To achieve this we can evaluate needs and run mini-workshops that individuals from different teams and experience levels can jump in and out of. What’s so different about Outperform? The sessions will be delivered by our award winning Managing Director Dawn Roberts (formerly National Training Manager for BUPA Healthcare, responsible for the training and development of a workforce of 700+ across 3 sites). Dawn is an inspiring and motivating speaker, trainer and coach who regularly speaks and presents at business events and writes a monthly sales advice column for several newspapers. Dawn has successfully delivered sales and service training for thousands of delegates across the UK. Dawn helps organisations, teams and individuals to fall in love with their customers, products and processes.